Basic search and seizure laws apply to ourselves, our homes, and our vehicles - but to our kids locker contents? How far is too far when we talk about the privacy rights of our children? In the wake of many devastating and horrifying school shootings, drug deals, and bullying scandals, the right to privacy for our children and how it weighs against their overall safety has become a topic of hot debate. 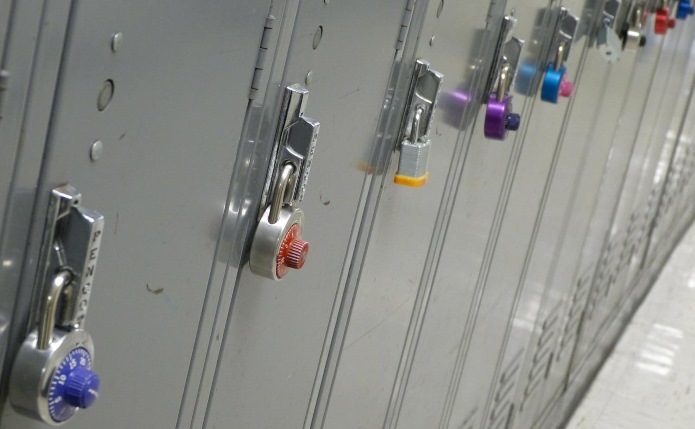 school administrators, parents, and children, have all come forward to voice their varied opinions on just what constitutes “reasonable grounds” for a locker search. Lockers provide a great deal more to students than just a place to toss their books between classes. They provide students with a sense of individuality. I don’t know about you, but my locker was covered in magazine clippings, mirrors, pictures of friends, and always had room for my ever growing lip smackers collection. They also allow children a “place of their own” within the school itself, keeping them grounded and allowing them to feel more secure in their environment. Lockers can help prevent injury, by providing a place for heavy books, lunches, or notebooks, keeping them off of your child’s back when they’re not needed in the backpack. Lockers also help to teach children responsibility and organization. Knowing what to put where, and making sure that they are adequately prepared for the next task. Ensuring that any necessary books or assignments are taken out at the end of the day and brought home with them. Each of these are just a few of the many great reasons that your child should have a locker within their school available to them, but just because it is theirs, does that mean that school officials shouldn’t be able to search them at will? When can teachers search student lockers? Student privacy has always been a topic of rich discussion, but the one takeaway is this- is your child's individuality more important than their safety? There’s no question in my mind that teachers and school administrators top priorities are the safety and education of our children. If, at any time, a teacher or school administrator deems it necessary to search a student's locker, they should absolutely be able to, right? Wrong. According to the supreme court, the only time it is justifiable to search a student's locker is “when there are reasonable grounds for suspecting that the search will turn up evidence that the student has violated either the law or the rules of the school”. Certain school districts have taken this ruling even further, to include the need of “articulable facts”, so the hunches of the individuals that you have personally entrusted to care for the safety and security of your child are no longer enough. Consider your child’s school as you would your home: The teachers and school administrators are there to protect your children, educate them, and keep them safe. Much as is your role as a parent in the home. Your child’s locker is essentially their room. It’s their own private space that they have to exert their individuality and creativity. But there are limitations. If you suspected your child of hiding drugs, guns, or other equally concerning paraphernalia- would you wait until you had “articulable facts” to look for these things? Doubtful. Yes, our children deserve a space that is entirely their own, where they feel comfortable expressing their individuality and creativity. Yes, that place should come with a reasonable amount of privacy. No, we should not continue to undermine the authority of our teachers and school administrators. If a locker needs searched for any reason, then the adults that are present should have every right to look into a student's locker. Because, as they say, if there’s nothing to hide, then why be afraid of someone looking?